Paul Rezendes specializes in natural landscape and seascape images from across the US, with a special emphasis on his native New England. He is the author/photographer of the highly acclaimed guide Tracking & the Art of Seeing: How to Read Animal Tracks and Sign; The Wild Within: Adventures in Nature and Animal Teachings; and a stunning photography book coauthored with his wife, Paulette M. Roy, Wetlands: The Web of Life. His other photography books include Martha’s Vineyard Seasons, a series of Lighthouse Companion Guides for the New England states and Long Island Sound, and Massachusetts Impressions. Paul first began photographing in his late teens while living in his hometown of Westport, MA, but put aside his camera equipment for motorcycles and life on the wild side for several years. Life and families ensued and it wasn’t until his son’s wedding in 1983 that Paul picked up a camera again. He hasn’t stopped photographing since, although his photography has gone through several transformations over the years. Starting out primarily with a 35mm. Pentax K1000 camera, Paul began his career as a wildlife photographer, a natural expression of his love for nature, animals and the outdoors. He first began documenting animal tracks and sign in 1984, which eventually resulted in his first book, Tracking and the Art of Seeing which celebrated its 20th year in print in 2012. He also began putting his collection of slides to use by offering slide presentations and lectures on animal tracking and sign. In 1985, he and his wife, Paulette, expanded their program offerings to include outdoor workshops, and thus Paul Rezendes Photography and Nature Programs was established. For the next 19 years, Paul taught countless children and adults the language of the forest, deeply committed to helping people to not only observe and see nature, but to connect with nature and themselves in a profound and often totally new and different way. Paul is recognized as one of the country’s leading animal tracking experts. 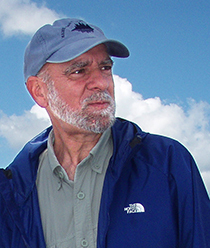 Many of his students have gone on to write their own books, established their own nature schools, and have contributed greatly to the growth of tracking as sound citizen science in North America. Paul and Paulette retired from teaching in early 2004 to devote their energies full time to their stock and fine art photography business. Concurrently with teaching tracking through the nature school, Paul also established himself in the world of nature photography, amassing a library of over 100,000 images. In between teaching engagements, he traveled by van to photograph wildlife and their habitats as often as possible. Eventually the woods, fields, rivers, lakes, mountains and seashores drew Paul more strongly in the direction of landscape photography than wildlife. Following that developing passion, he purchased a medium format Pentax 67 camera in 1992 to better capture nature in this expanded format. Just two years later, he purchased a large-format Toyo 45A II Field camera which allowed for an even better way to express his artistic vision, and to answer the needs of his clients requiring the highest quality imagery for larger applications. From then on, his love affair with the land and his desire to express its infinite beauty in large format photography has only grown, and when in 2002 he purchased a small sailboat, the ocean became an additional wilderness for Paul to explore with his cameras. Given the changes in the stock photo industry in recent years, Paul switched to digital in 2009 with a Canon EOS 5D Mark II. In 2015, he upgraded to a Canon EOS 5DSR along with a full contingent of Canon and Carl Zeiss lenses. Paul has been a featured photographer in Outdoor Photographer magazine. His photos have graced the covers of national publications, appeared on billboards and museum murals, and are featured in hundreds of calendars, magazines, posters, catalogues, postcards and books, as well as brochures and promotional materials for corporate and commercial accounts in the US and abroad. In addition to his stock photography business, he works on assignment and offers fine art prints for sale. When not traveling by all-wheel drive van or 30 ft. sailboat, Paul lives with his wife in a remote forest on the Millers River in Athol, Massachusetts.